It’s no secret I love a good mid-morning snack. Most of the time it’s fruit, nuts, or yogurt but occasionally I want something hearty. Croissants, muffins, and scones are all the perfect occasional treat in my book. And while I wish I could eat croissants every day, it’s nice to have a slightly healthier option. 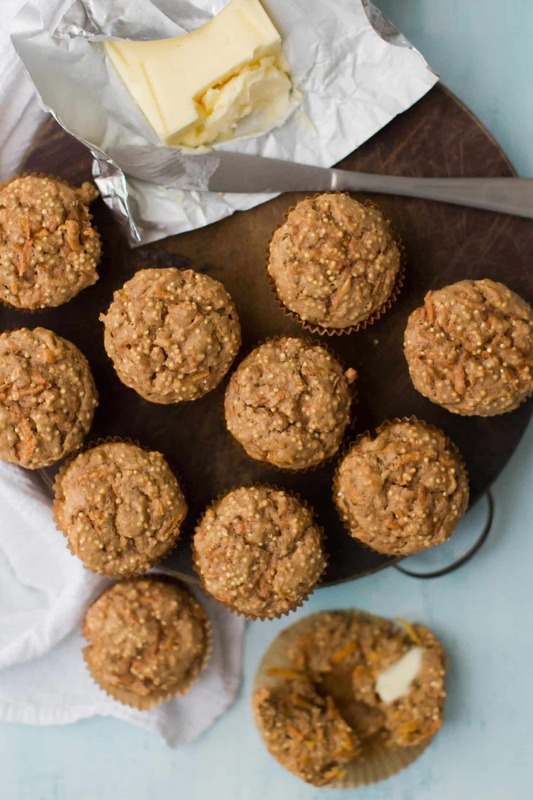 These carrot muffins are packed full of flavor and have a great crunch thanks to uncooked millet. Preheat oven to 350˚F and line a 12 muffin tray with muffins liners. In a large bowl, combine the flour, millet, spices, baking powder, and salt.. Give a quick stir and set aside. In a separate bowl whisk together the yogurt, maple syrup, egg, and melted butter. Add the yogurt mixture and carrots to the dry mixture. Stir only until batter comes together- you don’t want to over mix. Divide batter evenly into 12 muffins and bake for 22-25 minutes or until a knife is inserted and comes out clean. Store muffins in an airtight container for 3 to 4 days or freeze for longer storage. 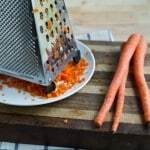 If the carrots seem moist, place in a colander and press out as much of the liquid as you can. Recipe inspired from this pumpkin bread. These carrot muffins are moist and almost feel like a meal between the shredded carrot and crunchy millet. My favorite swaps in these muffins are with the flour and even the millet. Spices: I stick fairly close to the list above but when I’m on a ginger kick, I like to toss in fresh minced ginger. Flour: While you can always fall back on all-purpose flour, spelt or other unique grain flours are great in these muffins. Grains: Millet isn’t the only grain you can toss in raw. 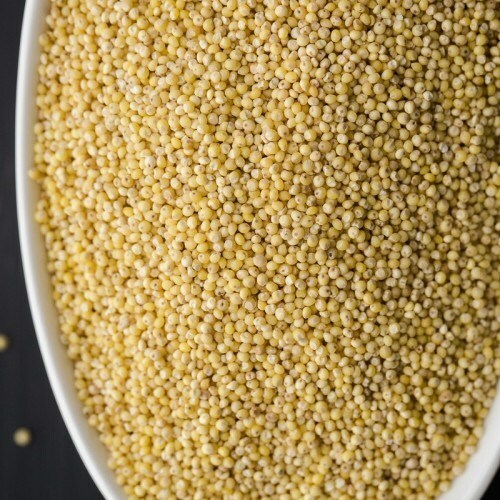 Quinoa and amaranth (other psuedo-grains) can be used in place or with the millet. If this is your first introduction to millet, be prepared to fall in love. It’s a quick-cooking, gluten-free grain that makes for a great breakfast or replacement for rice. || First published on January 5th, 2012. Last updated on January 17th, 2016. Yum! These muffins look fabulous, Erin. I’ve been tossing millet into quick breads lately and love the crunch! I love carrot cake so I should give these a try! What does millet tastes like? I didn’t really have a taste in these. It more added just an earthy undertone and a bit of crunch! Yum bear. I was just eating carrots with peanut butter and delighting in how refreshing they are. Such a tasty little veg, no? These look great! Think I will make them tomorrow! 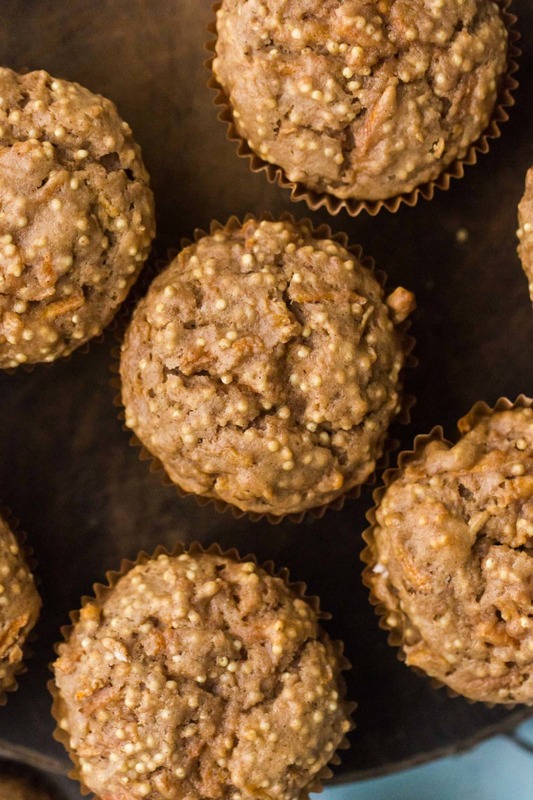 Another millet recipe to try is Heidi Swanson’s Millet muffins from Super Natural Everyday. They are lemony, spelt-y, crunchy and delicious. Great recipe. I twicked it a bit. I used organic millet four instead the wheat, buttermilk instead of yoghurt, cold pressed rapeseed oil, and added almost 1 cup of cooked millet grains with some amaranth and they came out great. Just the next time I think I will add more maple syrup and spices to give them more character because I think mine came out a little bit too blant… Thanks for the inspiration! You might want to strain it- the greek yogurt is thicker and using regular might change the consistency of the batter. Do you have the calorie count for these? I’ve only had millet in its savoury form, but I am so curious about baking with it! I love all the warm spices in these muffins- so warming! I pretty much love anything with carrot in – these look like a winner! Made these last night following the recipe apart from adding a punnet of blueberries for extra texture and flavour- delicious. This looks really delicious! Thank you for all your great recipes. Your photos are always so colourful and vibrant and always make me super hungry haha 🙂 keep up the great posts! Loved it ! Altough I replaced the butter by oil and used normal yogurt instead of greek, they turned out perfect ! Very happy to discover a muffin recipe with millet. Can I use millet grits in place of the millet? Couldn’t wait for a response so I tried it with the millet grits; they came out great and still had a bit of crunch!! Sorry for the slow response but glad it worked out! Thanks for coming back and letting me know! Do you think I could sub some of the carrot for zucchini? Yes- you might just want to squeeze out some of the liquid from the zucchini! These look great. I think I’m going to make a big batch and see how well they freeze. They should thaw out just fine between home and lunchtime at the office, and I don’t need to worry about gluten. I made these and they were delicious but i couldn’t get them to cook on the inside. I kept checking them and probably left them in the oven for 10 minutes extra, and while the tops burnt, the inside never got fully cooked. Do you have any idea how to fix this next time? What brand of Greek yogurt did you use? I used Chobani, which was a little wetter than Greek yogurts like Fage so maybe that made a difference? Did you press the liquid out of the carrots? Or should I just try a higher temp in my oven and/or put them on the top rack instead of middle? Thanks! Hmm- it might be a combination. When I made them most recently, I used Clover but I’ve also used Fage and Stonyfield. I think your intuition with the carrots might also be right- I’m going to add that as a note. I would try a thicker yogurt and squeezing the liquid out before messing with the temp! Any idea how I might use leftover cooked millet in this recipe? You could probably swap 1:1. The millet in this recipe is treated more like a seed than a cooked grain, so using cooked millet would change the texture (but my guess would be that it would still work).